WordPress comes with some fantastic layouts for listing blog posts, such as the main blog page and category archives. But what if you want to list WordPress posts elsewhere on your website? Maybe you want to list posts from a specific category? Perhaps you want to list WordPress posts by author, tag, or something else. Maybe you want to list other types of WordPress content such as pages or custom post types. Well, you’ve come to the right place! I’m going to show you how to use the Posts Table Pro plugin to list blog posts or other information in a flexible table layout. 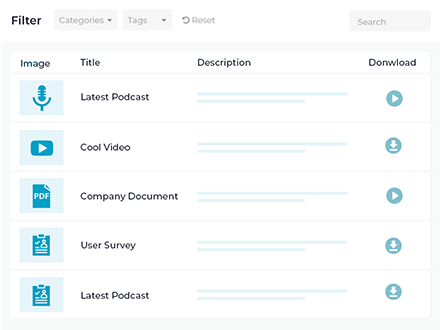 You can choose which columns to include in the table, and which posts to list based on their category, tag, date, author and more. And even better – it all happens automatically. It’s time to stop listing posts manually by hand! Create a list of posts on your WordPress site today! First off, I’ll tell you that I created this post to ‘scratch my own itch’. Until today, I’ve been wasting time by manually listing the tutorials for each of our WordPress plugins in our knowledge base. Every time I’d publish a post about how to use one of our plugins, I’d edit the relevant article in the knowledge base and manually add it to the list. Lots of people do this, but it was particularly stupid for me because here at Barn2, we have a plugin to fix exactly this problem! As a result, I spent about 10 minutes today using Posts Table Pro to replace the manual lists of posts in 5 articles from our knowledge base. It literally only took 10 minutes to list WordPress posts in 5 separate tables because Posts Table Pro does it all for you. See it in action on our list of Posts Table Pro tutorials here! Below, I will share exactly how I did. Then you can put it into practice and use the same method to list WordPress posts on your own website based on their category, tag, or whatever you like. But first I’ll share another case study of how one our plugin customers achieved the same on their own website. Journey with Omraam is a global community that continues to spread the teachings of the spiritual master Omraam Mikhaël Aïvanhov. The website is regularly updated with fresh content. All posts have been added to the Search All Posts page as a list of WordPress posts, and there are many, many posts – more than 700. So an easy way to sort through the list of posts was essential, that’s exactly why our Posts Table Pro plugin powers the page. Each and every blog post is listed in the table along with its title, first line of the post, author and date it was published. Visitors can browse the content in three ways. They can sort the table by the column headers. They could filter the list by selecting a category. Or, they can use the keyword search box. Either way will quickly help them find what they’re looking for. Read on to find out how you, too, can list WordPress posts on your website. 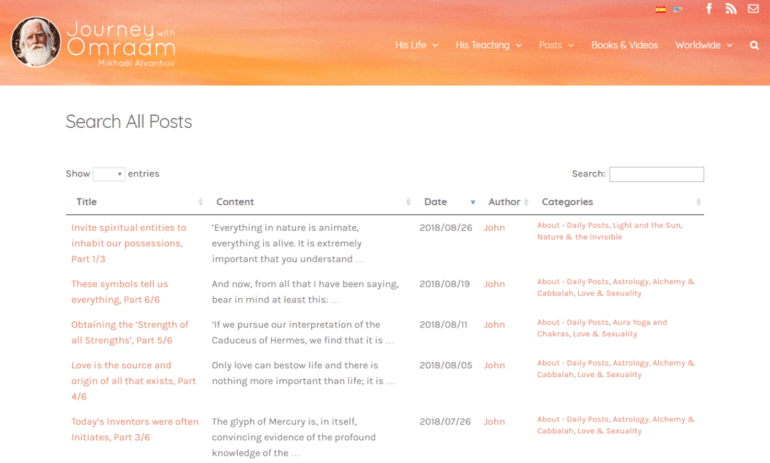 As you can see, there are lots of ways to display posts using different content views – whether this is a post grid or list for WordPress. The Posts Table Pro plugin creates a grid-based table layout, with each post listed as a separate row in the table. This builds on the content views that come with WordPress and your theme. Posts Table Pro lets you list WordPress posts or other content types such as normal pages or any custom post type. You can use it to list literally any post type on your website, including portfolios, documents, products, events, articles, news, tutorials, etc. Once you’ve decided what type of content to list using this WordPress plugin, there are lots of ways to choose what type of WordPress posts to display. Here’s a summary of them all. Afterwards, I’ll tell you how to set it up. At its very simplest, you can use Posts Table Pro to list all posts in a table layout. The optional lazy load setting ensures fast load times, even if you’re listing hundreds or many thousands of posts. You can either list the post names only, in a one-column table. Alternatively, you can add extra columns to show information such as content, excerpt, featured image, author, or date. You can list WordPress posts by category, listing content from one or more specific categories. Simply enter the name or ID of the category you wish to list the posts from. This is a great option if you want to list posts from a particular category outside of the category archive pages that come with WordPress itself. Check out our separate article on how to list category posts. As well as category, you can list WordPress posts by tag. Create a table containing posts that are tagged with 1 or more specific terms. For example, if you have a WordPress recipe blog for foodies, then you can create tables listing posts that are tagged with ‘healthy’ or ‘vegan’. It’s also possible to list WP posts by author – for example, if you want to create different lists of posts based on the user who created them. This is useful if you want to list posts by a specific author outside of the built-in author archive pages. List WP posts by month, year, day, or any combination of these date options. This adds more flexibility than simply using the date archives that come with WordPress itself. You don’t just have to list all your posts in reverse date order. Instead, you can create separate pages listing posts from a specific day or month. This is ideal for blogs that post regularly, WordPress newspaper websites, and similar sites. For even more fine-grained control, the plugin lets you list pages or posts based on their specific database ID. For example, this might be useful if you want to manually add a list of related posts to a WordPress blog post. Use the ID of each post to hand pick which related posts to include in the table, and add them anywhere within your post. If that’s not enough, you can also use custom fields or a custom taxonomy to list posts in even more weird and wonderful ways! Custom fields and taxonomies are a wonderful way of extending the information that you store about your WordPress posts and other content. If you feel the fields that come with WordPress itself don’t quite your needs, just use a free plugin to create custom fields and/or taxonomies. You can then use the Posts Table Pro plugin to list posts based on specific data. Posts Table Pro can list any type of post in WordPress, including custom post types. This is useful if you need to list something other than blog posts. For example, you might be creating lists of events, documents, portfolio projects, products, or something else. We’ve got a separate tutorial on how to list WordPress custom post types in a table. There are also exclude and exclude category options, which are handy if you need to exclude specific posts from the list. I’m always surprised at how often I list posts and then realise that there are a couple that I want to exclude. This is sometimes easier than choosing which posts to include, depending on how many you want to hide. You can choose whether to list WordPress posts on a page, in a blog post, or to automatically use the table layout in your category archive template or in the WordPress search results page. This makes Posts Table Pro incredibly flexible. You simply add a shortcode anywhere on your site, edit it to state what you want to include, and it will appear automatically on the front end. As well as providing flexibility in which WordPress posts or other content to list, the plugin lets you choose which columns to include in the post list table. Some people use Posts Table Pro to create a very simple list of WordPress posts. If this is what you want, then you can create a table that just has a title column listing the post name. Others use it to add extra information, which helps to encourage people to click on the posts and read more. For example, you can list posts with featured image, plus all the usual post data such as title, content, excerpt, author, date, etc. Posts Table Pro also makes it easier for people to find posts based on data such as category, tag or author. Each column in the table is sortable, and you can add extra controls such as search box and filters. You can also control the order in which posts are listed. For example, you can list WordPress posts alphabetically or in date order. Feel free to check out the full list of plugin options here. I’ve just focussed on the main ones for creating a WordPress posts list. The easy way to list WordPress posts anywhere on your site today! Before you start, you should have a WordPress website already set up with various posts that you want to list. 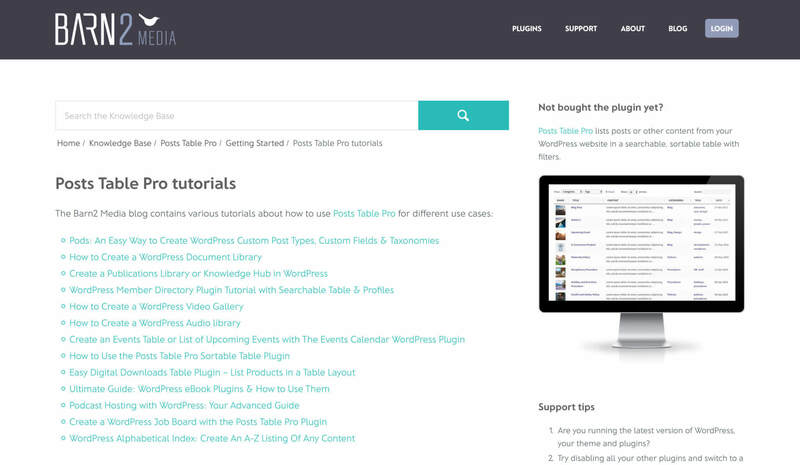 Get the Posts Table Pro plugin and install it on your website. Add this WordPress display posts shortcode to the page: [posts_table]. This will list all your standard WordPress posts with the default columns. Next, expand the shortcode by combining the following options as needed. Replace the bits in red with the actual name of your custom post type/category/tags/etc. Read this section if you want to list normal WordPress blog posts from the ‘Posts’ section of the WordPress admin. List WordPress pages – add post_type="page" to the shortcode. List WordPress posts by author – Add author="katie" to the shortcode. (Replace “katie” with the author username). That covers the basics. See the links above to learn how to list posts by custom field, taxonomy, and other types of data. By default, your list of posts will be ordered in descending date order, based on the post publish date. Use the sort options on the Posts Table Pro plugin settings page to sort the list alphabetically by post title. There are lots of other sort options for ordering your list of WordPress posts, too. This shortcode lists posts from a specific category with the slug ‘ptp-articles’ that ALSO have the tag ‘tutorials’. 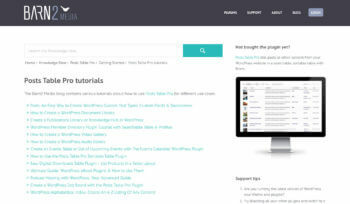 I did this because I wanted to list tutorials on a page, and not all the articles in that category are tutorials. Listing posts by tag as well as specific category solved this problem. The shortcode also includes columns for image, post title, excerpt and date – you can set these on the plugin settings page. I think this is enough to make people want to click on the tutorial to read it in full, without cluttering up the table. Finally, the shortcode includes a ‘tags’ filter to help people find tutorials about a specific topic, and hides any elements I don’t need. By now, you should have all the information you need to start automatically listing posts and pages on your own website. Whether you want to list posts by category, author, date or anything else, you can do it with Posts Table Pro. Get Posts Table Pro today and stop wasting time writing manual lists straight away!